Lately I’ve been thinking very deeply about music technology, and ways to go about integrating more of it into my teaching-learning environment and practice. However, I caught myself wondering yesterday: am I forgetting the most important bit…namely, the music? That gave me pause, and I had to stop and think for a while about what pedagogical goals I want to achieve with the technologies I want to bring in. I consistently have trouble bringing my students to mastery of some of the musical basics, like how to read notation and use it to compose, for example. It’s something that I wrestle with constantly. Part of the reason is because up to the end of year 10, students at my school can choose different electives every semester. Every time a new semester begins, I have a few students who have been with me from the beginning, and a few who are absolute beginners. 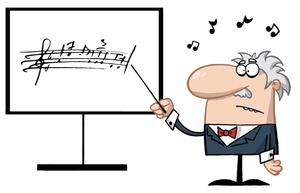 With each passing semester, the knowledge gap within a music class becomes progressively wider, and the required differentiation strategies become more and more varied. That also means that until year 11, it’s extremely difficult to put a developmental music program in place. Another reason why I find it difficult may be because the things I find easiest to do are often the things I find hardest to teach. The blessing becomes a curse because I have no real concept of “not getting it”. Aural dictation, for example. I can hear a melody inside or outside of my head and write it down pretty much immediately. I can also remember tunes I heard when I was six years old and haven’t heard since (I’m now in my mid-30s). I’m a synesthete, which means I see sound as well as hear it. Melodic lines, chord progressions, instrumental timbres, letters and words, and people’s voices all have colour, shape and texture, and sometimes (in rare cases) even temperature and taste. Every time I hear “Steer” by Missy Higgins, I get a sensation and a taste of a very icy cold orange drink in my mouth, a bit like Tang. I have no idea why or how I do any of that. Consequently, teaching aural skills is a real pain in the neck. I am forever going either too fast or too slow for my students, and I haven’t yet hit the right balance. Maths, on the other hand, I find very easy to teach. I used to fail maths at school, so I know exactly what it’s like to “not get it”, and to have to work through the process of coming to understand it. I’ve just finished teaching year 9 algebra this term. When I was in year 9, I was hopeless at algebra. These days I get it, and I also get why I get it, which makes it easier for me to explain the process to my students and see why they might be having a hard time. Every semester that I’ve been teaching music (which is now about eight years full time), I’ve put a new set of strategies in place to overcome these challenges. I don’t think I’ve yet had a semester where I’ve been able to look back and say, “I successfully taught all that I set out to teach”. There are times when I really don’t believe that I’m a particularly good music teacher. Oh, I think I’m good at teaching some things, and I think that I’m a pretty good teacher in general. But there’s something about being a good music teacher, which I constantly aspire to reach, and never seem to attain. I would like to have my students graduate from my subject, not just able to read and write notation, but to have a greater ability to listen deeply to any music, from whatever genre or era, and articulate what they’re hearing. I would like my graduating students to have a working knowledge of music history and musical genres, and be able to apply elements from any of them into their own compositions if they choose. I would like my students to be able both to compose and critique their compositional processes and outcomes, and to perform and critique their performances. I would like them to graduate, knowing the career opportunities available in the music industry and profession, and having the skills to take those paths. Yet I am aware: even though some things about music may have come easily to me, so many other things, like formal musical analysis and composition techniques, I never really understood until I was in my 30s. There are aspects of the arts which really cannot be appreciated until a person has reached a certain level of mental and emotional maturity, and to ask a high-school student to do so would be unreasonable. But then, there are other times when I really ought to have more faith in my students’ abilities to take things on board. It’s not always easy to decide whether or not I’m asking them to bite off more than they can chew. I am also aware that so little of what my students can do with music actually comes from me. It comes from they themselves as “vernacular musicians” (in the words of Dr Robert Woody), their own explorations in their own garages, on their own instruments. All I can really do is try not to kill their enthusiasm for what they’re already doing. When it comes to achieving all those lofty goals I listed above, I’m always aware of how little I end up attaining. So I try to find another way and hope it works the next time around. Now, with all these music technologies that I want to learn to use and have my students learn to use, I find that I have to take a moment to collect myself every so often and remember what it’s all for. It’s not just the technology that I want to teach: it’s the music. That, for me, is much harder. Music Technology and Staying Focused by Gabrielle Deschamps is licensed under a Creative Commons Attribution-NonCommercial-NoDerivs 3.0 Unported License.